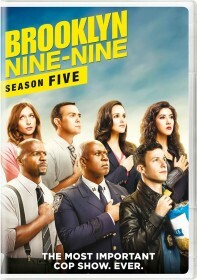 FOX has issued the press release for the penultimate episode of Brooklyn Nine-Nine's fifth season, "White Whale". Allison Tolman (Fargo) guest stars in the episode. Rosa and Amy team up to take down their "White Whale" suspect - a ruthless killer who has managed to elude them for seven years - while Terry helps Jake tackle his wedding planning chores. Then, Captain Holt and his rival, Olivia Crawford (guest star Allison Tolman), try to convince each other to step down in the campaign for Commissioner in the all-new "White Whale" episode of BROOKLYN NINE-NINE airing Sunday, May 13 (8:30-9:00 PM ET/PT) on FOX. FOX has not yet confirmed whether or not there will be a sixth season of Brooklyn Nine-Nine. The network will be presenting its fall schedule at its Upfront on Monday, May 14, although we might hear about the show's future before then.